Heat oven to 350°F. Sprinkle macaroons evenly in bottom of ungreased 13x9x2 1/4-inch pan. In large bowl, combine cake mix, water, butter, almond paste, almond extract and eggs; beat at low speed until moistened. Beat 2 minutes at medium speed. Spread batter over crumbled macaroons; pour whipping cream evenly over top of batter. Bake 50 to 55 minutes or until golden brown and edges begin to pull away from sides of pan. Cool 1 hour. 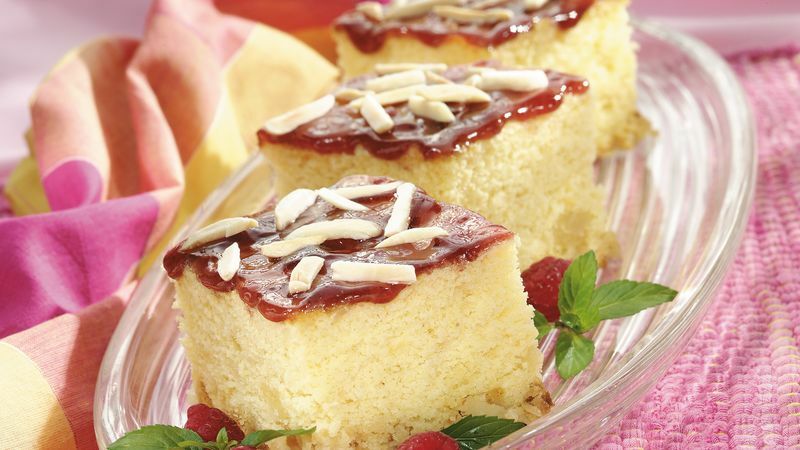 Spoon and spread jam over top of cake; sprinkle with almonds. For servings, cut into 3 rows by 5 rows. Serve warm or cool. Store in refrigerator. *To toast almonds, spread on cookie sheet; bake at 350°F 5 to 7 minutes or until golden brown, stirring occasionally. Do not use a pan that is less than 2 1/4 inches deep. Almond paste is a mixture of blanched ground almonds, sugar, liquid and sometimes almond extract. It is available in cans or tubes near the baking ingredients. If you own an insulated carrying case for a 13x9-inch baking dish, you can use the carrying case to take this chilled dessert to a family potluck.